From 14 to 17 April 2018 the Textile Machinery Exhibition (ITM) in Istanbul, Turkey, attracted visitors from all over the world. During the four exhibition days Groz-Beckert was delighted to welcome more than 2,000 visitors at their booth, showcasing the products and services of their product areas Knitting, Weaving, Nonwovens and Carding. Turkey is one of KARL MAYER’s most important markets; accordingly well prepared was the company when travelling to the country’s leading trade fair in the field, the ITM. From 14. to 17. April 2018, the world market leader presented itself in Istanbul on a newly designed booth and with contributions that met the market demand precisely and completely. For two years, the textile industry has been looking forward with great interest to ITM 2018 International Textile Machinery Exhibition, held on April 14-17. From the moment ITM 2018 opened its doors to the sector members from Turkey and many countries around the world, flocked to ITM 2018 Exhibition, make an indelible impression on visitors throughout the four days. For many companies in the knitting industry, Turkey and its surroundings are one of the most important strategic regions in the world. From 14th until 17th of April 2018 the International Textile Machinery exhibition ITM took place for the 34th time in Turkey. Being the biggest textile machinery exhibition in Turkey, the Middle East and the Near East, ITM 2018 opened its doors for participants and visitors from all over the world with a record-breaking participation. Necip Güney, Chairman of Teknik Fuarcılık arranged a press conference on the second day of the event. ITM 2018 continues with great enthusiasm and many domestic and international visitors. Meeting point for the textile world, ITM 2018 International Textile Machinery Exhibition opened its doors at TÜYAP Istanbul on April 14th, at 9:30 AM. With its grand opening, ITM 2018 exceeds all expectations. Organized by Teknik Fuarcılık and TÜYAP partnership in cooperation with TEMSAD, ITM 2018 Exhibition is one of the industry's most important global events as well as being the biggest trade exhibition in the region of in Turkey, the Near East, and the Middle East. The twelve-colour Reggiani COLORS printer and a Mezzera product for greener denim production make their debuts in EFI exhibit of advanced textile technologies. At the ITM 2018 in Istanbul, Zinser and Schlafhorst will be presenting their innovative linked winding solution for ring spinning to the global public for the first time. Saurer Spinning Solutions is represented in hall 3 with machines and services at booth 311B and with components at booth 303B. On the occasion of ITM 2018 SMIT is proud to present the brand-new model of the GS900 series released after the entrance in SANTEX RIMAR GROUP: SMIT GS980. Mahlo GmbH + Co. KG has been the perfect partner for over 70 years when it comes to straightening things out. The German machine builder has once again set standards in textile production and finishing with its generation 15 devices. Visitors of ITM can get an impression of the broad portfolio. SANTEX RIMAR GROUP and HAS GROUP (Hall 12 / Booth 1206) are looking forward to meeting a lot of customers at ITM 2018. Considering the whole complementary processes and specific customers’ needs, both companies are committed to innovation and machinery improvement. During the trade-show it will be possible to meet their staff at the booth and see some of their best-seller textile finishing products. 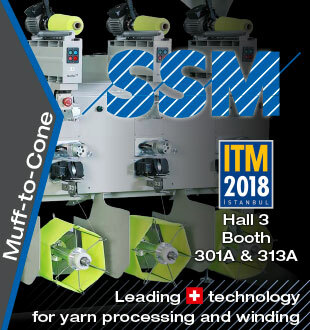 Leading computerized knitting machine manufacturer SHIMA SEIKI MFG., LTD. of Wakayama, Japan will participate in the ITM 2018 International Textile Machinery Exhibition in Istanbul, Turkey this month. A prominent market for SHIMA SEIKI computerized knitting machines with both an established export base to Europe as well as a growing domestic market, Turkey is a highpotential market for the company’s WHOLEGARMENT® knitting technology. DORNIER will demonstrate weaving machine solutions for clothing, home and technical textiles aimed at the Turkish and Central Asian market at the ITM. Besides denim, wool and carpets, in Turkey the machine builder‘s weaving machines are also used to produce technical textiles. Itema, the world’s largest privately held provider of advanced weaving solutions, including best-in-class weaving machines, spare parts and integrated services, will exhibit at ITM 2018 at the Istanbul TÜYAP Fair Convention and Congress Center on April 14-17. Turkey and the surrounding area represents for Itema one of the most strategically important regions in the world. Present in these markets for more than 30 years, Itema technology is very well represented and loved by Customers as confirmed by the excellent 2017 sales results. Van de Wiele is proud to present as a world's first the 3 meter execution of the Velvet Smart Innovator VSi for plain and jacquard velvets. The main specs of the machine include parallel reed motion, reinforced cross members, single beams over the full width and up to 24 servo driven smart frames. The VSi "345"-type is now available for plain velvets as well as jacquard velvets including light viscose carpets and prayer rugs. Bräcker (booth 313A in hall 3) will exhibit the high quality products and present the latest innovations at the ITM 2018 Exhibition. Bräcker’s products enable spinning mills to increase the production output at an efficient price-performance ratio. Mouvent has announced that the TX801 – its ingenious new digital textile printer – will be demonstrated live at ITM 2018, 14-17 April, in Istanbul, Turkey. This will be one of the company’s first ever global trade shows demonstrating the TX801 – an 8-color multi-pass digital textile printer producing the highest print quality on textiles with up to 2,000 DPI optical resolution, associated with very high printing speeds. Suessen will show the latest applications at ITM in Turkey. The exhibition will be held in Istanbul from April 14 to 17, 2018, at the Tüyap Fair Convention and Congress Center. Suessen welcomes the interested visitors in hall 3, booth 313A. Novibra Boskovice s.r.o., a leading company in spindle technology and the biggest exporter of spindles worldwide, will exhibit the latest innovations for the reduction of spindle energy consumption and maintenance costs at ITM in Turkey. The exhibition is held in Istanbul from April 14 to 17, 2018 at the Tüyap Fair Convention and Congress Center. Novibra welcomes the interested visitors in hall 3, booth 313A. KARL MAYER has prepared well for its trip to the ITM exhibition in Istanbul and expectations are running high. For the duration of this International Textile Machinery exhibition, which runs from 14 to 17 April 2018, this well-known manufacturer can be found in hall 7, stand 709 in the Tüyap Fair Convention and Congress Center in Istanbul. Graf will present the wide portfolio of solutions for clothings for short staple cards, roller cards and combs for combing machines at ITM 2018 in hall 3, booth 313A and together with the Turkish partner, Sarteks Makina Sanayi ve Ticaret A.Ş, in hall 3, booth 313B. The exhibition is held in Istanbul from April 14 to 17, 2018 at the Tüyap Fair Convention and Congress. The ITM 2018 fair is held at the TÜYAP Fair Convention and Congress Center in Istanbul from 14 until 17 April. Underlining the importance of the Turkish market, the Picanol team will be exhibiting two rapier and two airjet weaving machines in Hall 2, Booth 216. ITM 2018 International Textile Machinery Exhibition, which will be held between 14-17 April in the present year, will be organized by the partnership between Tüyap and Teknik Fairs Ltd Co. in cooperation with TEMSAD (Textile Machinery and Accessories Industrialists’ Association). The 15th International Istanbul Yarn Exhibition, HIGHTEX 2018 International Technical Textiles & Nonwoven Exhibition and the 8th International Textile Conference will be staged under the same roof. SPGPrints’ digital printing solutions using Archer® technology digital and advanced rotary screens for apparel applications will be presented on its stand (Hall 6 Stand 606B) at ITM 2018. Highlights of the digital offering at the stand will be the 1850mm-wide version of the JAVELIN® printer, a programme of inks for a wide range of fabrics, and information on other digital printers using Archer technology. At ITM, taking place from April 14 through 17 in Istanbul, the German automation and inspection specialist Erhardt+Leimer will present a new camera application for recognition of the front and back side of a textile web. The Albstadt-based circular knitting machine manufacturer Mayer & Cie. (MCT) is exhibiting three machines at this year’s ITM International Textile Machinery fair in Istanbul from 14 to 17 April. The company’s aim is to highlight its products and its corporate philosophy in a convincing display. Premium manufacturer Mayer & Cie. is featuring the Relanit 3.2 HS and the D4 2.2 II, both of which are established machines, while the OVJA 2.4 EM is a new addition to the MCT product range in the mattress ticking segment. The Turkish nonwovens market covers almost all application fields. Typical applications of needle-punched nonwovens are the production of artificial leather, automotive felts, carpets and carpet backings, insulation materials for thermal and noise insulation, geotextiles, industrial wipes and technical felts. Baldwin Technology Company Inc. is pleased to showcase the TexCoat G3 for the first time in Turkey during the ITM tradeshow, held in Istanbul from April 14 to 17, 2018. This groundbreaking Precision Application Technology product—which will be demonstrated in hall 12 at booth 1213—enables a sustainable textile and nonwoven finishing process, with low energy consumption, reduced water and chemistry waste, and substantial savings of production time and costs. The Turkish Ministry of Economy has announced the list of the procurement committee supports for the year of 2018. The ITM 2018 Exhibition, which will be organized between April 14-17 and in which the heart of the textile industry will beat, is included on the list. ANDRITZ will be presenting innovative nonwovens production solutions and textile finishing technologies for the Turkish market at Hightex 2018.